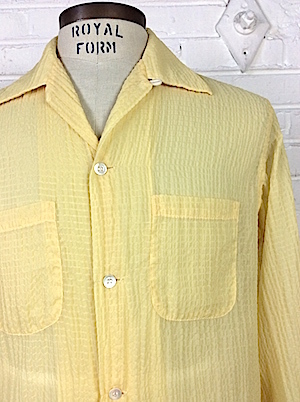 Home > Men's Vintage Shirts > Men's Vintage Shirts: 1940s > (M) Lemony Yellow 1940s-50s men's Sheer Nylon "Seersucker" longsleeve Shirt! 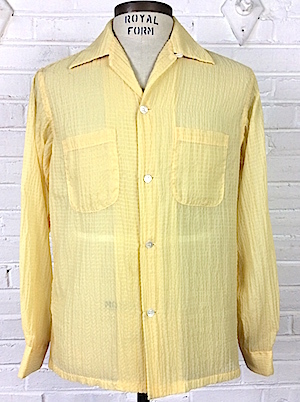 Men's vintage 1940s-50's lemony yellow nylon sheer "seersucker" shirt. Two chest pockets, straight hem, longsleeves, horizontal button holes and a hidden top button w/ neck loop. Made by Towncraft. "Single Needle Sleeve". Real shell buttons!